Long-exposure image from Hubble showing Pluto's three known moons plus P4, a new discovery. Scientists using the Hubble Space Telescope have identified a new moon in orbit around distant Pluto. Estimated to be between 8 to 21 miles (13 to 31 km) in diameter the moon has been designated P4… at least until a more fitting name can be decided upon. 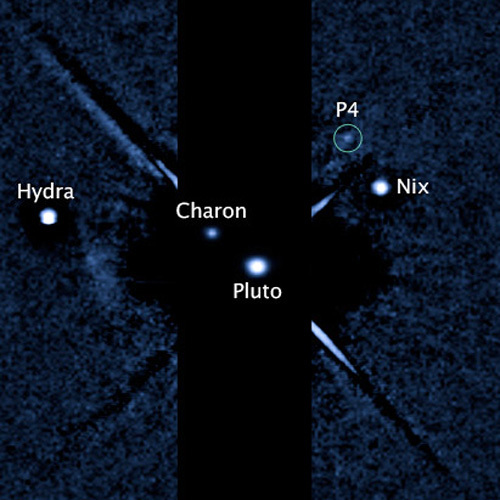 P4 lies between the orbits of Nix and Hydra, two moons discovered in 2005. It completes an orbit around Pluto about every 31 days. Pluto’s largest moon Charon is 648 miles (1,043 km) across. Nix and Hydra are each about 20 to 70 miles (32 to 113 km) wide.